I’m the first to admit that I tend to go a little overboard for my pet’s care. After all, as a life-long animal advocate, I’ve seen too much inhumanity, too much pain, too much suffering put on these animals not to want to reverse that in my own home. I’ve also seen how amazing, resilient and inspiring they can be. Even for me though, some treatments can seem too extreme for some pets. When I’m faced with a serious medical decision, it can be difficult and stressful to decide what’s right. Recently, I found myself in just such a situation with my dog, Fiona. I hope that my story might help you in the future. Meet Fiona, perhaps the worst candidate for treatment (or so I thought). 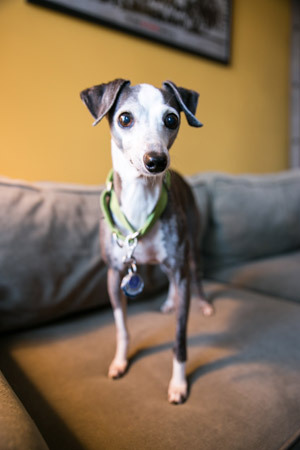 My little Fiona is an 11-year-old former puppy mill breeder who spent the first 7 years of her life in a cage, pumping out litters of (badly) purebred Italian Greyhounds. While her puppies were probably shipped to families across the country, she spent 7 years with little-to-no human interaction, affection or medical care. By the time she got to rescue she was so emotionally stunted that — despite being smaller, younger and healthier than many other adoptable dogs in NYC — she spent two years in foster care. She kept getting adopted and returned because she was so afraid to live like a normal dog. I met Fiona shortly after her second anniversary with K9Kastle, a great rescue group I volunteered with at the time. I took Fi on as a foster to help with her socialization. I hoped I could work to get her to a place where she could bond with other people. Eventually, Fi and I got her there, but also ended up falling undeniably in love on the way. So I “failed” as a foster mom and became Fi’s permanent “mom” instead. Two years later, Fi’s gone from the terrified pup who would duck for cover anytime someone moved, to approaching strangers on the street. (Thank you, bacon treats!!!) As she always did, she adores cuddles and chin scratches, but now seeks them out from people she doesn’t know. She’s even started doing a little post-poop dance and run in the mornings. Fiona’s not without her scars. Recurrent urinary issues and frequent stress-related colitis are two of the biggies. It took over a year to find a secondary caretaker who she’d be comfortable with when I traveled to keep her from developing heartbreakingly bloody stools from the stress. She’s never learned to play, but has found solace in stuffed kongs and rawhide chews. Medicating Fiona can set her off, so her veterinarians have often opted for the “wait and watch” approach when anything new comes up. It’s not that they don’t want to treat her; it’s that treatment has often made the problem worse. So Fiona didn’t seem (to me) like the kind of pup who would be a good candidate for chemo. When we discovered a rare form of mast cell tumor in her gum I assumed treating it would mean destroying any quality of life she had left – something I wasn’t willing to do. I’d never gone through chemo with my dogs or cats before. I’d known others who had tried it, to varying results. However, I secretly always assumed that chemo would be a little extreme, even for me and especially for a dog like Fi. And, lucky or not, any time I’d battled the big “C” with pets before, chemo wasn’t a good option. But then Fi’s diagnosis came back and, yet again, she started teaching me to throw all of my assumptions to the wind. I was given a GREAT referral to an excellent oncologist, and had a quick crash-course in mast cell tumors and chemo for dogs. The conversation was eye opening and soon, Fiona started chemo. Fiona’s now two weeks in and, amazingly, doing better than she has in months. Her poop-dance is back. She begs me and my partner for pets. She comes running down the hall, ears perked, at “wanna go for a walk?” She hasn’t started running away from me when it’s time for her meds, yet. Fiona’s got that one down.